Navy finishes six points ahead of UC Santa Barbara. SAN PEDRO — Weather conditions were no match for the Navy Midshipmen, as the military academy dominated the 2018 Harbor Cup, held March 9-11 at the Port of Los Angeles in San Pedro. Southern California might have been doused with some rain on March 10, but Navy spent most of that day and March 11 building and extending its lead over the field, as the Midshipmen finished the Harbor Cup in first place with 33 points. UC Santa Barbara’s Gauchos finished second with 39 points; University of South Florida (41 points), California Maritime Academy (44) and College of Charleston (50) rounded out the top five. Ireland, the only international competitor at this year’s Harbor Cup, finished sixth with 61 points. The Irish were followed by Massachusetts Maritime Academy (62 points), USC (68 points), University of Hawai’i (69 points) and Maine Maritime Academy (84). 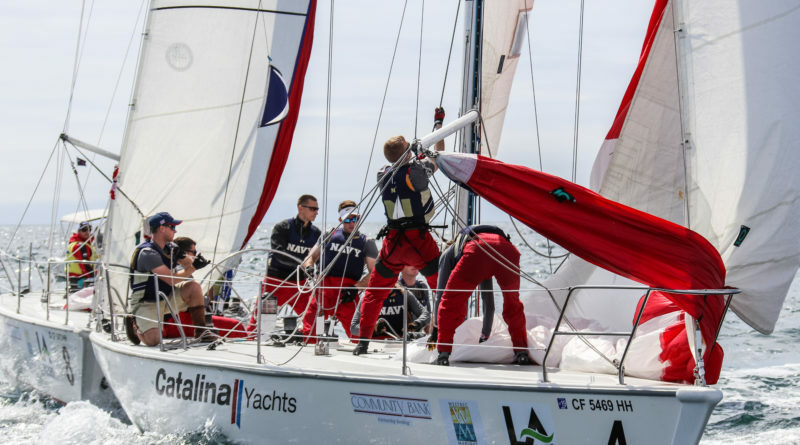 Cal Maritime hosted the collegiate regatta, which featured teams competing in Catalina 37s.